One of the great things about living in Phnom Penh, Cambodia’s capital city, is that even a pauper can afford to live like a prince. The cost of living is incredibly low. Rent can be as little as a few hundred dollars a month for a decent apartment in the heart of the city and the cost eating out is so reasonable that you’ll never have to cook ever again. Even if you’re on a limited pension or income you can easily cover your monthly expenses and have plenty of cash left over. So, what do expats in Cambodia do with all that extra spending money? That’s easy… We have as much fun as possible and indulge ourselves to our heart’s content. Luxury living is not restricted to the super-rich like it is in other countries. Here we can enjoy fantastic leisure and lifestyle experiences at a fraction of what it would cost back home. Life can be stressful wherever you live in the world but in Phnom Penh getting away from it all is a breeze. Escape to one of the many high-end spas where you will be treated like royalty for a very modest fee. I recommend Champei Spa and Salon in the BKK1 part of the city. It’s popular with expats of all nationalities and whenever I have visitors I take them there for a treat. If I head there on my own after a busy week at work then I’ll have a traditional Khmer massage which costs just $10 for an hour or $18 for two hours. The tension in my body simply melts away and the price is an absolute bargain. If I go with visitors we usually go for a foot massage, especially if we’ve been out sightseeing all day. Everyone has their own masseuse but they provide us a private room for the group so we can enjoy the experience together with the relaxing sound of classical Khmer music gently playing in the background. At $14 for a 90-minute foot massage it is well worth the money. And the pampering doesn’t stop there… They also have a luxury salon where a pedicure or manicure will set you back only $5. You could spend the whole day in the spa and salon and still struggle to spend more than $40. 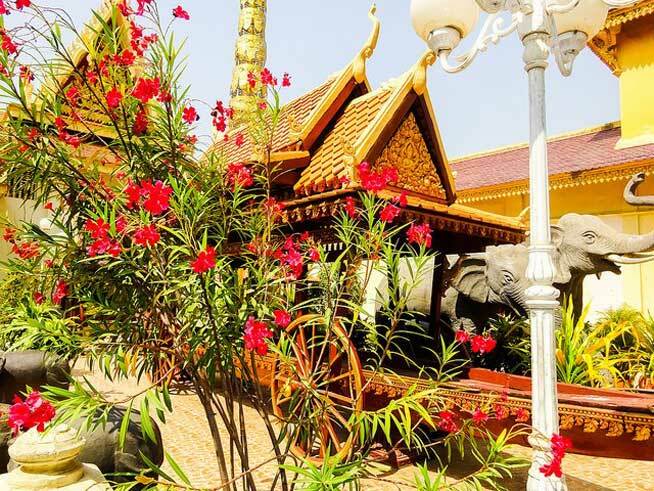 Cambodia is well known for its artisans and it’s also a country that’s obsessed with style and fashion. Accordingly, there are many extraordinarily talented tailors based in Phnom Penh. These guys have an uncanny skill in replicating any type of designer suit you’d like to have made to measure. All you need to do is provide a photo of your dream suit then simply choose from a selection of high quality fabrics imported from Europe. They will then take very detailed measurements of your body and ask you various questions so they can customise everything to your preference. A week later you return for the first fitting so they can review what alterations are needed to ensure your suit will be a perfect match for your body. Usually by the second fitting you will have an extremely comfortable and stylish suit you can be proud of. And the cost for all of this? Depending on the fabric, style, and cut a bespoke suit from one of the city’s leading tailors will cost from $150 to $250. That’s about 10 times cheaper than what you would pay for the same quality and service in Australia. Golf is incredibly popular among Cambodia’s business and political elite but unlike other countries the golfing scene is not restricted to VIPs. You can go to pretty much any club in the country without being a member and find yourself playing alongside a friendly billionaire or government minister. And it is far from expensive. In fact it’s downright cheap for courses of such a high-standard. The 18-hole Garden City Golf Club is one of the best golf courses in Cambodia—it’s managed by global sports giant IMG—with green fees of $105. If that’s still a touch outside of your budget then try the 18-hole Cambodia Golf & Country Club which charges $36 for 18 holes. Or for a mere $20 green fee you could play nine holes at City Golf instead. Sign up here for IL Australia’s e-letter and we’ll send you five free postcard e-letters weekly. We’ll also send you a FREE research report on Cambodia: A Low-Cost Kingdom of Wonder.